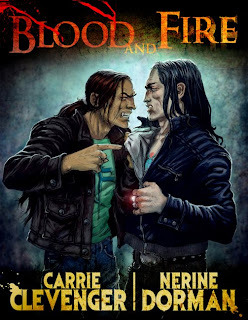 I've long been a fan of Carrie Clevenger's Xan Marcelles, and in this novella, the bassist vampire is marched out of Pale Rider, in Pinecliffe, Colorado, and into a hellish house of mysteries. He's not the only one - Ashton Kennedy, written by Nerine Dorman, is a being known as an Inkarna (essentially a body thief) and he's charged with the task of breaking into the same mystery house to retrieve an ancient artifact. The unlikely pair team up in order to bust some heads and get the hell out of there. I'll be honest upfront - I loved this. I started with the intention of savouring each chapter and taking my time, but I ended up absolutely whizzing through it. Carrie's Xan chapters are written in his inimitable style, and contrast nicely with Ash's more esoteric and worldweary ways. I always enjoy reading Xan's chapters but it's been a real pleasure getting to know Nerine's Ash. The pacing is excellent, taking us from Xan's Ordinary World of Pinecliffe, and into the hidden mysteries of Luxor House. The house was so well-described I felt like I'd actually been there, and the dual observations make it really pop from the page. The action never lets up, and I would love to see a paranormal thriller from these two. I can't actually recommend it enough, and as an extra incentive, the book will be free on February 10, 11, and 12! If you can't wait until tomorrow, you can download it from Amazon US and Amazon UK. I'll be digging into that soon enough!